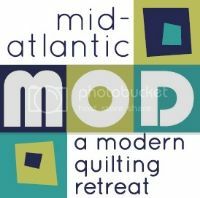 mid-atlantic mod: a modern quilting retreat: Volunteer Signups, Workshop Supply Lists and More! Volunteer Signups, Workshop Supply Lists and More! Details about our "attendee marketplace"
Announcement of new activities and services at MOD 2016! If you did not receive the e-mail in your inbox, please check your spam folder. Volunteer Signups, Workshop Supply Lists and More, I have so many volunteers and I will love to send them to your way, How can I contact you?